Newman University is a genuinely distinctive university with a strong sense of community where students are welcomed, supported and challenged to achieve their potential. Newman is a different kind of university; we’re driven by the belief that higher education should enable us to develop new ways of understanding the world, and help make a positive impact within it. Our students become independent thinkers with ambition, empathy, and a lifelong love for learning. 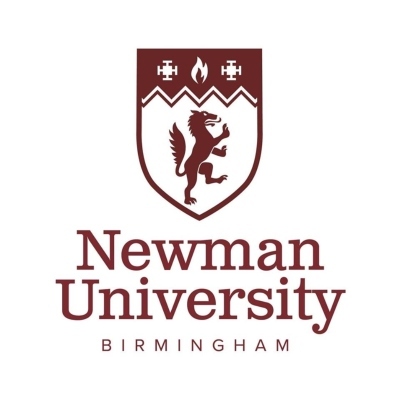 Newman University achieved full university status in 2013 and prides itself on providing a formative education for students, helping them develop excellent subject knowledge alongside the personal skills and character they will need to thrive and be active citizens in the wider world. Founded as a teacher training college in 1968, Newman now offers a wide range of degrees, primarily in the humanities and social sciences. We remain well-known for our ITE and programmes with a strong social focus. We consider our strengths to include our values as a faith-based institution with a distinctive emphasis on Catholic Social Teaching, and our personal approach as a small university with a strong sense of community where students are treated as individuals on a single, well-appointed campus. Newman is committed to access and widening participation and has one of the highest intakes from state schools of all universities. It consistently exceeds sector averages and location adjusted benchmarks for recruiting students from under-represented groups including mature students, disabled students, students from low participation areas and students from families with no previous H.E. experience. We aim to be open and transparent in our processes and actions, working with people and communities in sustainable and mutually beneficial ways for our core educational purposes but also the greater good of society and the protection of the environment. In terms of governance, our board processes are accountable and democratic, we adhere to ethical and good business practice, for example in our equality and diversity policies, and our funds support social & environmental impact. Social Enterprise is at the heart of what Newman University values, does, and seeks to develop with its students and staff. Newman works closely with a variety of third sector and public sector organisations as well as other employers – both providing work placements to students, which is a compulsory part of our degree programmes that has played a key role helping Newman graduates enjoy one of the highest graduate employment rates and working with organisations to help employees develop the specialist skills they need to thrive in their roles. We promote Social Enterprise among students and staff through initiatives, competitions, and events that encourage them to come forward each year with ideas to make a difference. We reward the best student ideas and provide support to explore these further. Some develop into embryonic social enterprises which we recognise through larger package of support, including a business grant, training and mentoring. We are building strong and effective partnerships with other social enterprises. These include organisations as diverse as Aquarius (whose mission is to support people to reduce their reliance on alcohol and drugs), St Paul’s Community Development Trust (providing services to the local community in one part of Birmingham) to Birmingham St Mary’s Hospice. Newman is supporting these and many more to be effective in what they do. In turn, the social enterprises we work with support Newman, as we prepare our students with the employability skills to navigate a portfolio career and make their impact in the world. The University launched Newman Health & Wellbeing (whose business model is that of social enterprise) in 2016 with a vision to improve the quality of life for individuals and to make a positive contribution to the communities and organisations to which they belong. Initially offering Counselling & Psychotherapy (for children, young people and adults), and Youth outreach (building connections with young people locally), the venture seeks to deliver high quality, professionally led and cost effective services to individuals, communities and organisations within the Birmingham area. A Wellbeing service has subsequently been added to the portfolio. We have many socially supportive links and projects among our academic staff, including, for example, the Community & Applied Drama Lab (CADLab), founded in 2010 within Newman’s Drama department with an Entrepreneurship Award from HefCE & UnLtd. We have many other collaborations with regional and public institutions, national charities, social organisations, and community groups. Our Chaplaincy is open and welcoming to all faiths and is committed to ensuring that all are free to worship. Students and staff are welcome to join in the activities of the Chaplaincy, including services, retreats and social activities. The Chaplaincy is open and welcoming to all faiths and is committed to ensuring that all are free to worship. We aim at Newman at being environmentally friendly, championing social justice, paying the living wage, living simply and sustainably, supporting our local community, and being open and transparent about our expenditure and accountable and democratic in our governance. Newman also provides a short course for Health Mentors at its campus in Bartley Green. The one year part-time course was developed with social impact company, Evolve, and prides itself on being an innovative staff training programme. The level 4 course provides bespoke training for Health Mentors deployed into schools by Evolve, providing opportunities to study in groups, complete work shadowing and partake in independent work placements. We support our students to find placements and employment with socially progressive employers. We are currently involved in a Higher Levels Skill Match Project is an ESF-funded two year project which aims to bring local employers and universities together. As an example, we are working with St Paul’s Community Development Trust to give our students real-world work experience working with parents/families experiencing challenging situations in their lives. HLSM agreements such as this will expose our students to working with forward-thinking ethical organisations, broadening their horizons and enhancing their chances of success once they graduate. By carefully matching students with employers we offer quality work experience opportunities while enhancing the social impact of those organisations. Smart Works Birmingham, a local charity which helps unemployed women into employment said “[your student] has helped us a lot by helping us improve our social media sites and helping plan ways of increasing our following … [it] is amazing because we can now create different looking posts to what we used to have and our reach has grown enormously” while our student said “Through my work with HLSM I have managed to network with amazing business owners and gain various references from well recognized organisations that look great on my CV. I can recommend the scheme to anyone who has an interest in boosting their employability”. Within our Counselling & Psychotherapy service we currently have 25 student practitioners undertaking their workplace placement with us. Of those, 14 are child practitioners who have placements both within the service itself and remotely in schools, helping to support vulnerable young people across the West Midlands. All the child practitioners are enrolled on the Masters in Integrative Psychotherapy at Newman University and have been trained to work creatively with young people in order to meet each individual client at their particular stage of development. It has been recognised in recent years that there is a desperate need to address child mental health - we believe our practitioners provide an invaluable service offering early intervention to young people that could positively impact on their wellbeing in later life. The remaining student practitioners work specifically with adults and these placements are undertaken within our premises on the University campus. Most of the adult clients are self-referrals, with some being referred through their workplace. Our wellbeing in the workplace service exists both to improve the health and wellbeing of employees, and engage and motivate employees to ensure organisations thrive. Alongside a member of the Newman Health & Wellbeing team, we have student undertaking a work placement, and 2 further students involved in the co-delivery of our wellbeing workshops. The ReachOut Project aims to work with young people in schools and public spaces in 3 wards with lower than would otherwise be expected HE take up. It involves a team of 2 youth workers and Newman University students engaging with some of the most socially excluded young people aged 13-19 in those areas. We believe the innovative and informal approach taken by the project (taking advice and guidance out into schools and spaces where young people gather and enabling access to sport and leisure activities on the University campus) has created space for a constructive dialogue with young people who are not likely being reached by existing initiatives. Teachers in local schools anecdotally identified lack of aspiration and the attraction of gang culture as influencing local young people, many of whom are drawn from white working class backgrounds that are highly under-represented in HE. Since 2011 we have continued to recycle. In 2011 Newman had 2 skips being emptied on a daily basis by Birmingham City Council. Since then, as a result of recycling paper, cardboard, plastics and bottles Newman now only has one skip which is emptied once a week. This is a reduction of 90% which is an incredible result. Savings and revenues made from selling recyclable materials on the open market are re-invested into other green projects approved by the Environmental Committee.Unwanted goods such as clothing, kitchenware and bric-a-brac from our Halls of Residence are donated to a local charity for homeless people or the PDSA. Used blankets are donated to Birmingham Dogs Home. During our 2017 “Green Week” we gave out or planted on site 250 Norwegian Spruce trees. These were taken away by staff or students to be planted in their own homes or gardens with any that were left being planted around the Newman campus. This was the first time an event like this was held on campus and was received very well and gathered positive feedback. We have 7 composting areas on site and these are primarily maintained by on-site contractors. These are all located in relevant areas of the campus. This enables all of the grounds waste from the flowerbeds, cuttings from trees and shrubs to be composted. The resulting compost then gets recycled and returned out into our grounds and flowerbeds. The University promotes sustainable travel wherever possible. We have secure places for people to lock up their bicycles and we have regular events where we promote cycling to Newman, walking, car sharing and public transport. During the year we host at least one “cycle to work” day/week. This is usually held as part of the national Cycle to Work Week and there are usually incentives to encourage staff and students to take part. We are currently in the process of adding cycle routes and times onto our website for those wishing to cycle to Newman from different areas. There is the option for staff to purchase a bicycle as part of a Cycle to Work scheme. We disseminate news internally through the weekly newsletter, our intranet and website, and through our magazine Enterprise News. Our social impact is recognised in grants for our academic work (for example, from Children in Need) and through our community engagement, for example via Newman Health & Well-Being, as well as through our extensive and longstanding work with schools in the West Midlands and beyond. In terms of AWP, the Sunday Times 2019 Good University Guide, has ranked Newman 9th in the UK for providing social inclusion for students. EcoCampus is an Environmental Management System (EMS) and award scheme that has been designed specifically for universities in the UK. It aims to aid institutions in moving towards environmental sustainability through good operational and management practices. Newman has been awarded with the Gold stage of EcoCampus for the second time after a re-audit in October 2017. Newman has now begun working towards the Platinum award. EcoCampus allows universities to identify, evaluate, manage and improve their environmental performance and practices across the campus. In May 2017 Newman University was the first university to be awarded with the Catholic Agency for Overseas Development (CAFOD) Livesimply award, this was delivered by the Chaplaincy Department and the award recognises our commitment and actions to live simply, to live sustainably with creation and to live in solidarity with the poor. Newman has been awarded Fairtrade status since 2007 and this reflects Newman’s mission which is based on respect for others, social justice and equity. Both Newman’s Sanctuary Café and Atrium Café sell a range of Fairtrade coffee, tea and chocolate and it is standard procedure for Fairtrade tea, coffee and sugar to be served in meetings across campus. Each year, with the help of the Students’ Union, we take part in Fairtrade Fortnight and try and encourage as many staff and students to get involved. As an example, the Reach Out Project has engaged with a total of 277 young people in the six months between April and September 2018. The outreach component has involved 144 young people engaged in 252 separate engagements. The majority attend the local Bartley Green School. This report shows a total number of young people engaged as 133. This total can be broken down into numbers of engagements across year groups. All these students attend school in an NCOP ward. The Reach Out Project has produced a short promotional film. The Project Lead has also submitted a research bid to the Nuffield Foundation that focuses on young people’s use of social media in public space. If successful this would support two youth worker posts and fractions of academic posts for 2 years from July 2019. Newman Health & Wellbeing has worked with over 300 child and adult counselling clients since opening in October 2016. Clients have presented with wide ranging issues around depression, anxiety, loss, trauma, relationship issues, stress and workplace concerns. After completing therapy clients are often more able to deal with life, so this may involve returning to work/resuming full hours, improved quality of relationships and an improved sense of wellbeing. When one person in a community is struggling this can impact the wider members of the group, so affecting couples, immediate families, wider family networks, but also reaching out into school and the workplace. Counselling and psychotherapy can help resolve some of these issues to minimise this potential for conflict. The ability to access counselling and psychotherapy services can vary widely dependent on where people live, Newman Health & Wellbeing is able to offer free short-term counselling to specific client groups through membership of the Living Well Consortium or more affordable long-term psychotherapy. Newman Health & Wellbeing is one of the few providers in the local area where we are located, providing important referral pathways for GP surgeries, family support teams, social workers, schools and faith based organisations. Our sport and health area currently works on a range of research projects with partners including Birmingham and Solihull Mental Health Foundation Trust (BSMHFT), Aston Villa Football Club Foundation, Birmingham MIND, Birmingham and Solihull Recovery College (for which our Head of Sport and Health is Chair of the Advisory Group), Sport Birmingham, and Birmingham County FA. Newman staff actively contribute to voluntary organisations involved in supporting families, the homeless, and young people including the National Council of Citizens UK, Barnardos, and St Basils. Our research and scholarly activity also promotes health and wellbeing in the community. For example, CADLab was established in Newman’s Drama department with an Entrepreneurship Award from HefCE & UnLtd in 2010. Most of the CADLab projects are linked to research in the field of Applied Theatre and Wellbeing, evaluating theatre’s effectiveness in supporting the wellbeing of children, young people and those suffering from illness during their stay in hospital. CADLab operates in partnership with Birmingham Children’s Hospital NHS Trust, Heartlands Hospital NHS Trust and, Acorns Children’s hospices and has now performed to over 1000 children at their bedside. Based primarily in Senneley’s Park adjacent to the University, Leyhill, Woodgate Valley and Northfield areas. The outreach team has also begun regular sessions at a local church talking to young people as they come back from school. We have delivered a range of activities such as discussions centred on raising aspiration and attainment, their safety on the streets, managing anxiety and pressure from bullying on social media. Forthcoming plans include study sessions in the church and visits to Newman. We have also convened several network meetings with local community groups and local residents. These have revealed the barriers faced by local families that limit young people’s educational attainment, aspiration and access to Higher Education, for example difficulties navigating the social care system. Over the summer we offered the opportunity for families and other young people from the community to take part in a number of activity days. This gave the families some quality time together and a chance for the ReachOut team to start to build relationships with young people and discuss their aspirations for the future. Some of our students are offered the opportunity to travel to The Gambia; while there they work alongside a charity called Building Futures in The Gambia (BFiG), which focuses on building schools and improving education facilities and resources. Newman University became a Learning Destination for local primary schools in 2013 for the Children’s University, an international extra-curricular programme which aims to promote social mobility by taking learning outside the classroom. In terms of our carbon footprint and promoting a sustainable environment Newman secured a £150,000 grant from the Revolving Green Fund and has used this to fund intelligent lighting and upgrading the boilers. Our intention is to use the savings from the Revolving Green Fund (estimated to be £35,000 per year) on more sustainable projects. We approved a Carbon Management Plan in March 2011, and we committed to reduce our carbon footprint by 30% by 2015 and by 43% by 2020. We reached our target for 2015 and will continue being energy efficient to reach our 2020 target. We now have solar panels installed on two of the buildings at Newman and we now produce 10% of our own electricity on campus by using Solar PV. Our prospectus is produced using paper which contains post-consumer waste, pre-consumer waste and product from well-managed forests. We operate an Employee’s benefits scheme in addition to chaplaincy and spiritual care, free tea and coffee, a staff room, free on-site parking, and a discounted travel scheme. Benefits include an Employee Assistance Programme, Occupational Health and Counselling Services, childcare facilities, and a cycle to work scheme.